My mother used to make it with ordinary canned beets, an endive, and a recipe she had for Quick Pickled Beets. 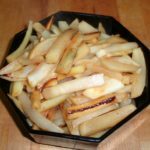 She used the endive at Christmas time – and sometimes other times – but also would substitute a raw onion, sliced into rings. 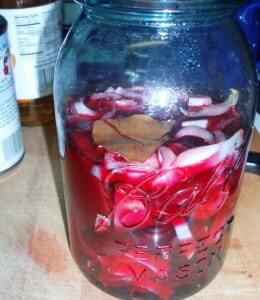 The hot brine mellows it, so it is still a bit crunchy without being too pungent. I’m sure this is not the beet recipe she ate in Denmark. 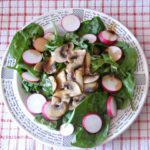 I have found some Scandinavian recipes for pickled beets, and they’re spiced differently – and they are also canning recipes. I am not really sure how they would work when I then added the raw vegetable, endive or onion. I have absolutely no idea where she got this – a magazine? a friend? no attribution… I have it in the notebook of recipes I copied when I had my first apartment, in college. Anyhow – this is very easy. 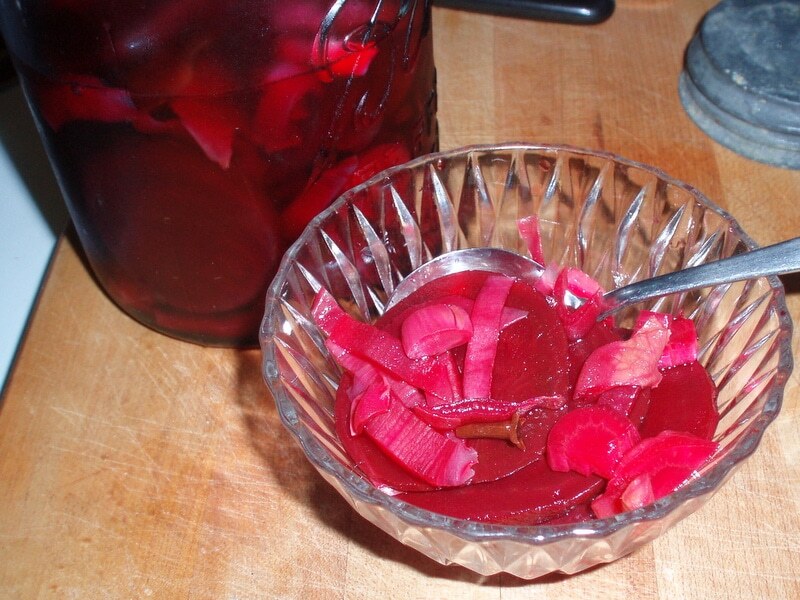 You take a can of beets – just plain sliced beets, not already pickled – and pour out the liquid into a saucepan. The recipe called for half a cup, so I did measure, here, but I usually reserve the rest, in case I need more liquid to cover the beets in the jar. Add the vinegar and spices to the pan. Bring it to a boil, simmer for just a minute or two. 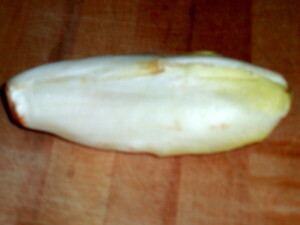 Meanwhile, slice the endive across and separate the leaves. 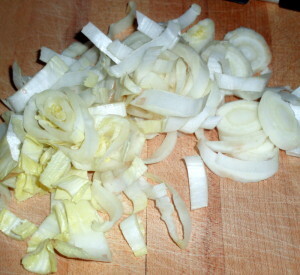 (If you use onion, I usually slice it in half from root to stem, and then slice it in half circles – you can keep it in rings if you like.) 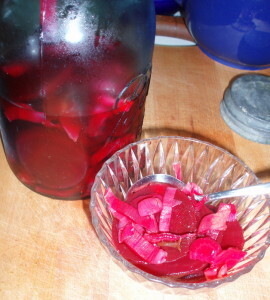 Layer the beet slices and the endive alternately in a jar. Pour the hot beet liquid over the vegetables. 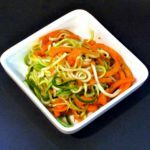 Make sure you pour directly on the vegetables, so it cools slightly before hitting the glass… If I’m not using a canning jar, I let the jar stand full of hot tap water a few minutes before filling it, so the glass isn’t cold. I’ve never had it crack, but… I’d rather be a bit careful. 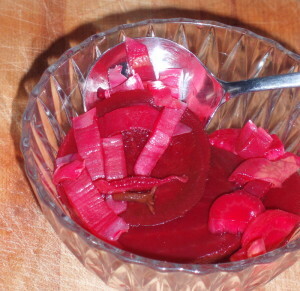 Make sure the liquid covers the vegetables – if it doesn’t, add any reserved beet juice. 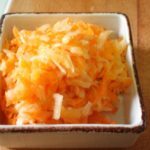 You may want to use a spoon to press the vegetables down evenly into the liquid. Bring 1/2 cup of liquid from the can of beets, vinegar, and seasonings to boil in a small saucepan. Simmer 2-3 minutes. 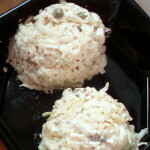 Refrigerate at least overnight, preferably a day or two. 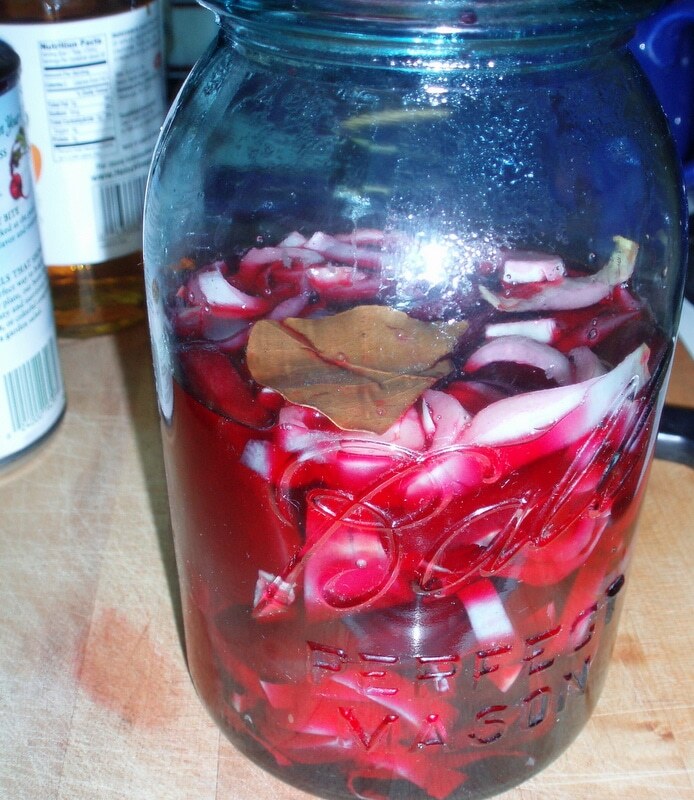 This method doesn't really preserve - it's more for flavor. But it does taste good!